The City maintains the natural beauty and integrity of our river valley and ravine system as a valuable resource for all Edmontonians. As part of protecting this natural asset the City requires separation between any development and the abutting valley or ravine. The Top of Bank Policy (Policy C542 - Development Setbacks from River Valley/Ravine Crests) provides more details. 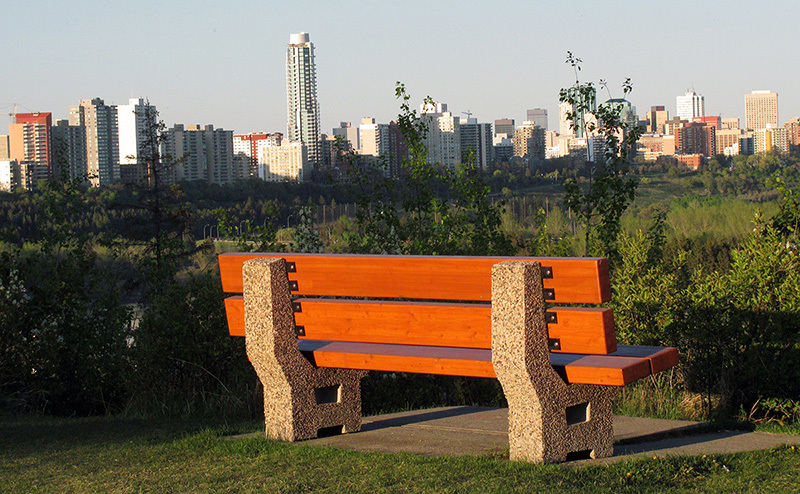 Edmontonians who live near or beside the river valley and ravine system need to be aware of how they can preserve slope stability and protect their investment by limiting changes to property and the use of water near the valleys and ravines. Installation of swimming pools, skating rinks, ornamental ponds, hot tubs, cisterns, septic tanks, or other water and wastewater retention structures. You can plan your residential project online in order to find information about obtaining your permit(s). Water retention structures, such as swimming pools, skating rinks, ornamental ponds, hot tubs, and so on. In the rear yard and side yards, hard surface (for example, concrete, asphalt) landscaping is limited to a total of 12 sq. m per yard. The remainder shall be landscaped with permeable landscaping materials. For some properties, similar restrictions may be registered as a caveat against the title for property abutting the valley and ravine system. Please call 311 if you are concerned about activity happening in the vicinity of the valley and ravine system. Once the City is notified, staff can investigate whether proper permits are in place.